We strongly recommend that you measure the old bathtub and draw an accurate floorplan of the entire bathroom, including any plumbing like faucets and drains. Note the length and width of your bathtub space. Be sure to mark whether the drain is on the left, right or center part of the tub area. It’s easier to move things around on paper than to haul heavy bathroom fixtures around a small, cramped space. As is often the case when dealing with older homes, replacing the bathtub is a good news-bad news situation. Expect that when you pull out the old tub, you’ll have to level the sub-floor before setting the new tub into place. Every building, including homes, settle over time. You’ll want to use a level and add mortar, or whatever material the manufacturer’s directions specify, and make sure the floor underneath your new tub is level and able to hold the weight of the new fixture. The good news is that almost every tub can be removed from the small bathroom by placing it on its side and carrying it out vertically. While learning how to replace a bathtub in a small bathroom you may need to recruit a couple of strong friends to help with this step. You’ll probably have to remove the sink and toilet before removing the old tub and bringing in the replacement. It will give you and your crew more room to move around, and that’s something they’ll need and really appreciate. After you’ve placed the new tub, you may have to use shims to ensure the flange and drains match up to your fixture. Pro tip: You can dry-fit most of your new tub’s plumbing, including the drain and drain shoe, before trying to place it. It will be easier if you get most of it done ahead of placement. Attach the drain and place a generous bead of caulk all around the perimeter. Then, reattach the faucet. Fill the new bathtub and check for water leaks. Keep in mind that the mortar, caulking, or plumber’s putty needs a full 24 hours to set completely. It’s best to wait until the materials are completely cured before doing the test for watertightness. Reinstall the sink and toilet, and replace any drywall and tiles as necessary. Replacing the bathtub resembles solving a jigsaw puzzle, but it’s a job that can be done as long as you have patience. What’s even better? 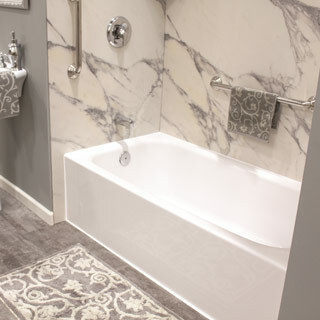 Today’s modern tubs give you so many options, from acrylic tubs that resist mold and mildew to deep bathtubs that provide you with a luxury treatment. Once you’ve completed the project, you can rest assured that you’ll have a rejuvenated bathtub to enjoy for years to come.